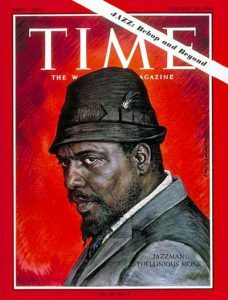 With today being what would be Thelonious Monk’s 100th birthday, I thought it would be appropriate to honor his legacy by making my blog post about him. Monk is widely considered to be one of the greatest jazz pianists, and as a jazz pianist, I consider him to be one of my personal idols. Monk had a unique, unpredictable style while improvising, characterized by his angular melodies, use of dissonance, and a highly percussive attack. Monk is often credited as one of the founding fathers of bebop, the dominant style of jazz in the United States from the 40s to the 60s. Monk’s mastery at the keys is rivaled by his ability as a composer. A large amount of his compositions have made it into the standard jazz repertoire, including “’Round Midnight”, “Straight, No Chaser”, “Blue Monk”, “Epistrophy”, and many more. Almost as unique as his playing style is his sense of fashion, which typically included a suit, sunglasses, and a wacky hat. The Monk song I decided to share in this blog post is “Straight, No Chaser” which is one of Monk’s most popular compositions. 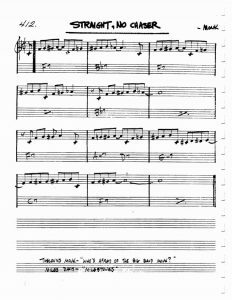 In this tune, Monk uses simple a simple 12 bar blues progression and a single melodic idea. The melodic idea is continuously displaced within the measure and has a unique ending each time. The result is extremely original and creative. Since it’s original recording in 1951, the tune has been covered by an array of jazz giants, including Miles Davis, Bill Evans, Keith Jarret, and Cannonball Adderley. Monk’s uniqueness and abrasive style made the general public slow to embrace him, but his genius was slowly realized over time. 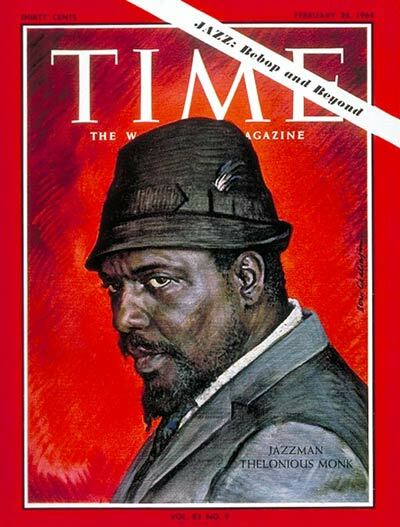 Thelonious Monk’s passed away in 1982, but he was certainly not forgotten. His impact on the state of jazz is immeasurable. Enjoy this recording of Monk playing with his combo in Italy in 1961. ABBOTT, FRANCES. “Monk, Thelonious: (1917–1982) JAZZ MUSICIAN.” In The New Encyclopedia of Southern Culture: Volume 12: Music, edited by MALONE BILL C., by WILSON CHARLES REAGAN, 294-96. University of North Carolina Press, 2008. http://www.jstor.org/stable/10.5149/9781469616667_malone.135. Givan, Benjamin. 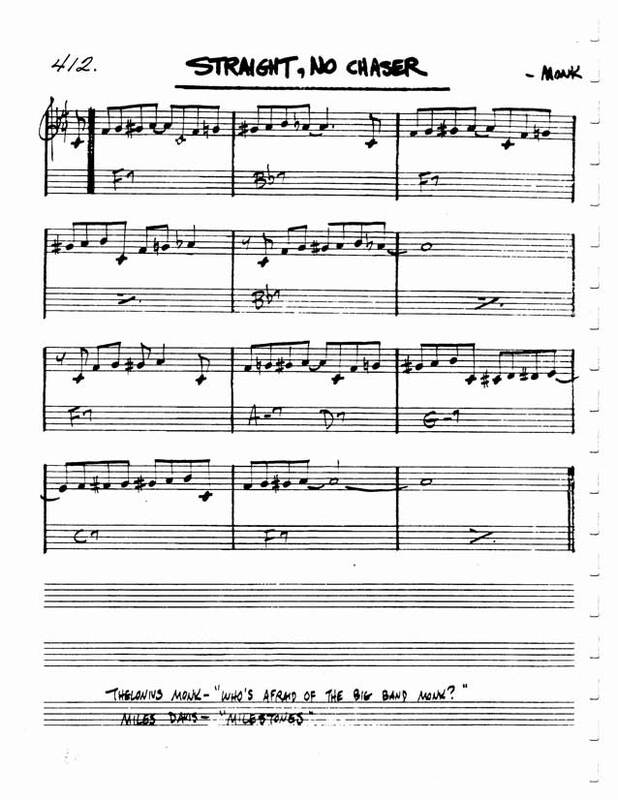 “Thelonious Monk’s Pianism.” The Journal of Musicology 26, no. 3 (2009): 404-42. doi:10.1525/jm.2009.26.3.404. Bebop was a jazz form birthed from a revolt against popularized commercial music. As such, it was bound to have backlash and evoke strong reactions among the listeners. While researching this topic, I didn’t expect to find what I did: throughout decades of this music being around, the reactions have been somewhat… racist. And the racist remarks coincidentally point to the Chinese. See for yourself, as the article below shows a conversation at the U.N. which was published in the New York Times October of 1953. This article aims to point out the bias of the Chinese interpreter at the U.N. discussion. As the English representative used the work “bepop” which was a cognate in 4 of the 5 languages present. 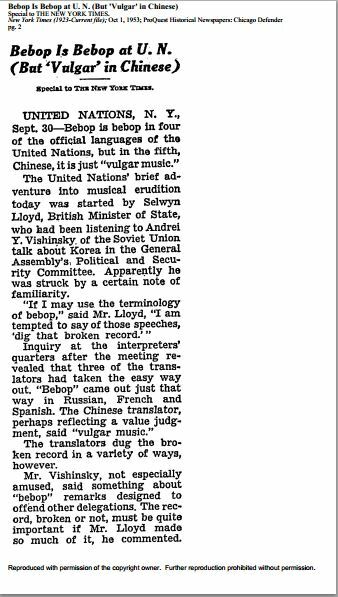 However, the Chinese interpreter translated “bepop” to “vulgar music.” So why is this strange? Well on the front page regarding Bepop in the book Music in the Modern Age, there’s a quotation from Louis Armstrong as he disparagingly referred to Bepop as “Chinese music.” This is pretty funny, isn’t it? After all, the Chinese representative would probably disagree with Louis, unless he thinks Chinese music is vulgar. So why did I decide to write my post about this? I think the article really struck me and resonated when reading Armstrong’s quotation because this is not the first time in history it has happened. We have associated Eastern music with something that is different and, often, strange. Bepop was a strange form of jazz, and it was easy for listeners to describe it as Chinese with a negative connotation, labeling it strange and foreign, and perhaps unpleasant to listen to. Unfortunately, this trend has not disappeared, as film scorers often use pentatonic scales to invoke the environment of Eastern lands or foreign places, tying down that scale to just that one location. Even the soundtrack of Bug’s Life is ridden with this, and it won many music awards. I just think we as viewers and listeners need to be conscious of how we associate certain sounds with certain cultures, being careful to see music as an open connection where cultures and individuals can influence one another, not a stagnant and reliable sound to be scrutinized. In Freedom Sounds, Ingrid Monson discusses how many jazz artists of the 50s and 60s were idolized as icons of the Civil Rights movement. Cats like Hawkins, Coltrane, and Parker were given nicknames like “Bird” and were then lauded as the free, independent individuals many Black Americans wished to be. The genre of vocalese is one such example of the sycophantic nature of many musical colleagues of the bebop jazzers. Perhaps the originator of vocalese in 1940, Eddie Jefferson recorded many jazz hits such as Coleman Hawkins’ “Body and Soul.” In the recording, Jefferson matches exactly Hawkins’ phrases but with added words. The very first line of the track attributes the song to Hawkins. “Don’t you know he is the king of saxophones? Yes indeed he is….Hawkins is his name.” Vocalese is an entirely different approach to jazz music than the bop stars of the era. Instead of beginning with a “head” and trusting to the improvisatory skills of the musicians to solo over the chords, Jefferson obviously spent a lot of time carefully listening to Hawkins’ style and choosing the perfect words to correspond to the fragments of melody. This genre of jazz is a great honor to the original performers, as it carefully matches their original solos while providing lyrics detailing their talents as well as contributing some important history. Later on, The Manhattan Transfer recorded the same track, using Jefferson’s words, but in a four-part harmony. This recording travels even further from the improvisatory nature of bebop. The close harmonies necessitate prior arrangements. But the group kept the sycophantic nature of vocalese, changing some lyrics to include attributions to Eddie Jefferson instead of Jefferson’s original praise of Hawkins. They continue the evolution of vocal jazz while still keeping many of the same characteristics. The Manhattan Transfer exemplifies the sound of another earlier popular vocalese group: Lambert, Hendricks, and Ross. A trio, the group was successful for their tight harmonies and accessible imitation of jazz instrumental artists. One of their most commercially successful tracks, “Four Brothers,” was based on the Woody Herman orchestra’s hit of the same title. Hendricks’ lyrics feature very instrument-specific verbs. As in the vocalese style, much is based upon the original instruments. “Blowin’ that horn” is sung often, as if in their imitation, the singers are becoming instruments themselves. Vocalese was a way for vocalists to enter the musically complex bebop scene while still remaining commercially relevant. Popular vocal groups followed the trend of lauding musicians like Hawkins and Coltrane while still exhibiting their own significant talents in imitation and lyrics, a front not accessible by instrumentalists. Herman, Woody, performer. Woody Herman & His Orchestra 1956. Recorded February 20, 2000. Storyville, 2000, Streaming Audio. Accessed April 7, 2015. http://search.alexanderstreet.com/view/work/982437. Lambert, Dave, John Carl Hendricks, Annie Ross, Freddie Green, Eddie Jones, Sonny Payne, and Nat Pierce, performers. Sing A Song Of Basie. Recorded March 13, 2001. Universal Classics & Jazz, 2001, Streaming Audio. Accessed April 7, 2015. http://search.alexanderstreet.com/view/work/690250. Crawford notes that the representation of women in jazz music was primarily restricted to vocal performance and singing. That being said, the contribution by these female performers was quite significant and one wonders how the nature of jazz could have been enhanced if more contributions existed of female composers or instrumentalists in the genre. While the beginning displays an incredible lyrical and smooth quality to it, the last half of her performance contrasts this with a much crisper consonants, harsher vowels, and an improvisatory, drawn out rhythmic quality. Entirely other music techniques can be seen in her performance of “Nobody Else But Me” which possess much more of the style of the last half of “My Favorite Things.” Long, held-out alto notes create a power and confidence in her voice steering away from the more soft, sensual or sultry sound of other vocal jazz music. The question of women’s role in jazz music can raise interesting questions of how the genre of jazz might have been different if more women composers had been represented. It is also interesting to contemplate how the genre may have changed, if at all, if it had possessed more female composers and more male vocal performers. 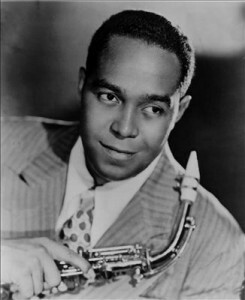 When Charlie Parker died on March 12, 1955, he left a massive void in the world of jazz. While tragic, it was inevitable: a long battle with heroin addiction had threatened his life in the past. Though he didn’t invent the genre, he was widely considered to be one of the “fathers of bebop” who had galvanized the transformation of Duke Ellington’s “specialized jungle rhythm” into the virtuosic, intellectual, and cutthroat style of post-war jazz. While this concern may seem legitimate in the face of tremendous loss, modern hindsight rejects the notion that death can halt the development of musical style, particularly when that development stems from a genius. Parker, aside from being responsible for the partial transformation of musical sound, was also responsible for the transformation of musical thought. He revolutionized the way jazz musicians though about harmonic approaches to improvisation. He also drastically increased the use of contrafact composition (composing over existing harmonic material), expanding the framework in which jazz musicians could operate and providing a model for how they could develop their musical chops. The anonymous author describes a person that, trapped within the gritty and difficult world of the inner-city, finds consolation in thinking about Bird and memorializing him through graffiti. For him, Bird (Parker himself as well as the nickname) symbolizes the ability to know “the freedom inside his head that allowed him to dream- and fly up, out and away” from the challenging circumstances of his life. 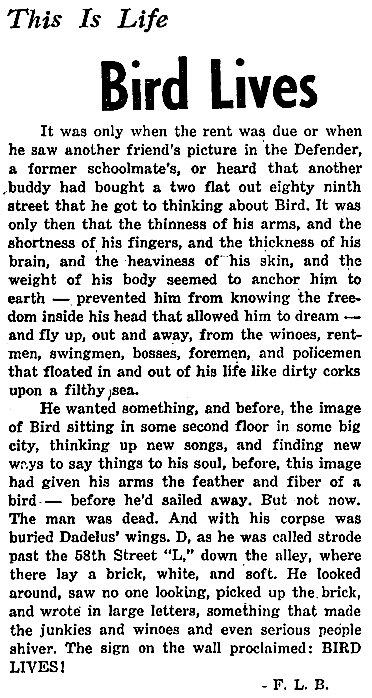 The author invokes the name of Dadelus, the Greek man who dreamt to fly away from his prison cell via his own ingenuity. Dadelus serves as a parallel to Bird, who used his innovative music to fly away the past and change the landscape of jazz, becoming a mythological figure in his own right. With these two articles together, it almost seems as though the latter serves as a direct answer to the former. Bird’s music will not die because people’s dreams will not die. And as long as people continue to dream, the creativity and passion of Bird will be memorialized in both stone and flesh. The connection of flight and dreams as they relate to Parker remained relevant into the 1960s, as jazz musicians reacted to the development of the civil rights movement. As Bird did before them, they used their own perspectives to mold jazz into an expression of freedom. Bird and his music lived on, and will continue to as long as musicians continue to dream. Special. 1955. 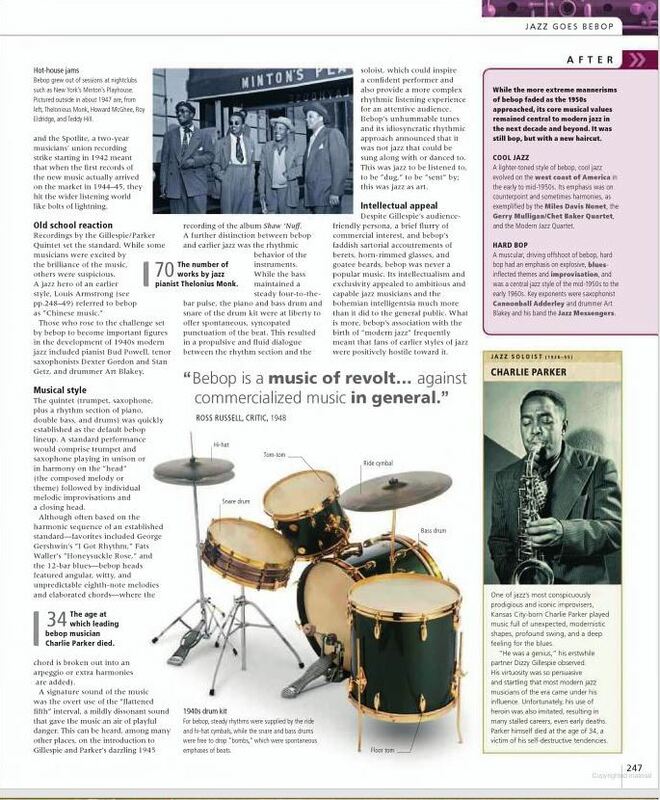 “Death of ‘Yardbird’ Parker may Affect Bebop’s Fight to ‘Live’.” The Chicago Defender (National Edition) (1921-1967), Mar 26, 6. http://search.proquest.com/docview/492930917?accountid=351. F.L.B. 1960. 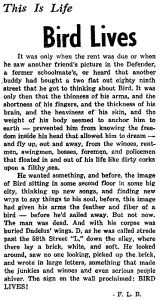 “Bird Lives.” Daily Defender (Daily Edition) (1956-1960), Apr 04, 1. http://search.proquest.com/docview/493786203?accountid=351. John Coltrane is known as one of the world’s most skilled saxophonists. As a jazz composer as well, his pieces fell into the bebop and hard bop jazz genres before incorporating modes and spearheading the free jazz movement. He was never one to do the same thing twice. He is also known for taking a theme or melody, stretching it out over a long period of time (sometimes as long as 45 minutes), repeating it over and over, playing it differently with each repetition. In August of 1964, columnist for the Chicago Defender Louise Davis Stone managed to exchange a few words with Coltrane during the intermission of one of his shows. She asked him a question that was on the minds of many: whether or not the jazz genre was fading and losing the interest of many of its listeners. Coltrane did not give a concrete answer, saying, “I don’t know whether jazz is dying or not. My records are selling well and I’m happy about that. I have no fear about my music being too way out. You are not going to find something new by doing the same thing over and over again. You add something to the old. You have to give up something to get something.”¹ Not having a firm answer can seem a bit disconcerting to some, especially to those to thoroughly enjoy the jazz genre. However, Coltrane’s comments about adding something to the old has merit. How else will an artist forge their own paths if they only cover exactly what has already been written and performed? 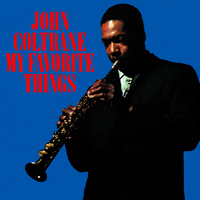 When Coltrane arranged “My Favorite Things,” for example (https://play.spotify.com/track/6oVY50pmdXqLNVeK8bzomn), he was not interested in performing it the same fashion as Mary Martin and Patricia Neway from the original Broadway performance (Sound of Music). He turned the vocal line into a solo for saxophone. The general “groove” of the song was changed as well from the original. Coltrane added new things to the old, made it his own, and gave the track a new life and spirit. To the modern ear of the time, these alterations sounded more new age than what they were used to. That is exactly what Coltrane is not afraid of: new ideas and concepts that make the listeners’ ears perk up. ¹LOUISE, DAVIS STONE. “The Jazz Bit.” The Chicago Defender (National Edition) (1921-1967), Aug 01, 1964. http://search.proquest.com/docview/493094849?accountid=351.